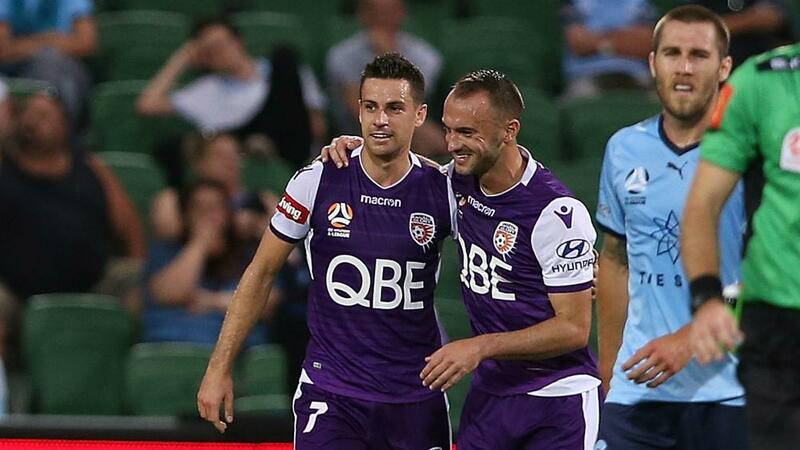 Perth Glory moved six points clear at the top of the A-League after they eased past Sydney FC 3-1 and Melbourne Victory lost for the first time since October. The league leaders began Wednesday with a three-point gap to both Sydney and Victory, before results went their way in a potentially pivotal round of action. Glory were good value for a commanding three-goal half-time lead as they tore through the Sydney defence at will, with Joel Chianese the star of the show. The former Sydney forward turned in Jason Davidson's cross for the opener before prodding the second past Andrew Redmayne, despite appeals for handball as he controlled. Chianese turned provider on the stroke of the interval as Brendon Santalab applied a clinical finish and Sydney, who had won their last nine against Glory, were left with a mountain to climb. A mix-up at the back allowed Adam Le Fondre to rifle in a consolation goal after the restart, but Sydney could not rescue a result. Victory had already missed the opportunity to temporarily take top spot as they went down 2-0 at Adelaide United earlier in the day. Craig Goodwin stretched to direct Nikola Mileusnic's low cross past Lawrence Thomas after 18 minutes, before Ken Ilso stripped Thomas Deng of the ball and ran clear to slide a finish under the goalkeeper for a quick second. The dominant hosts could have led by a wider margin at the break, but they had to dig in through an entertaining yet scoreless second half. Terry Antonis came closest for Victory with a superb effort that crashed against the crossbar as their unbeaten run ended at nine matches to leave them playing catch-up alongside Sydney.